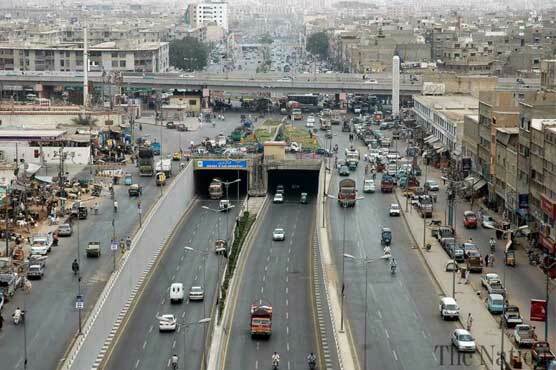 Normalcy has returned to Karachi on Tuesday as transport is flowing smoothly, markets are open and life is moving on as usual in the metropolis after the attack of Muttahida Qaumi Movement (MQM) workers on a private channel’s office. According to details, the situation is returning to a normal routine as offices, educational institutions, petrol pumps and hotels have been opened. The activists of Pak Sarzameen Party (PSP) have also waved Pakistani flag at Mukka Chowk. Earlier on Monday, violent MQM workers clashed with police and surrounded the office of a private news channel in Karachi by taking down the gate of Madina Mall and broke the windows of the building. The violence erupted soon after the powerful exiled leader of MQM Chief Altaf Hussain, gave a telephone address to his supporters in which he castigated the media for not giving due coverage of his workers. Aerial firing was also carried out in the area whereas two people were reported injured because of the stampede. One of the injured, named Mohammad Ayub succumbed to his wounds later on in the hospital. A contingent of Rangers was called in to handle the situation at Madina Mall while MQM workers also manhandled with police on the streets, sparking volleys of gunshots and tear gas in several places across the city, police and witnesses said. After which, MQM leaders Farooq Sattar, Khawaja Izharul Hassan, Aamir Liaquat and Amir Khan were taken into custody by Rangers from outside Press Club just when they were about to address the media. Rangers arrived just ahead of the press conference and barred the MQM leaders from speaking to media. Read more: What MQM Chief Altaf Hussain actually said? Rangers had also sealed MQM central secretariat Nine Zero in Azizabad neighbourhood and seized arms and anti-Pakistan literature. Police have also sealed many sectors and unit offices of the party in different parts of the city, including Orangi, Landhi and Korangi and zonal office in Hyderabad. The MQM, run by Hussain from London — and accused of using extortion and murder to cement its grip on power — has long been blamed for ethnic violence in Karachi. It has clashed repeatedly with authorities who, according to rights groups, have resorted to hundreds of extra-judicial killings during a ‘clean-up’ operation that began in 2013 in a city already plagued by violence.